From hobbyist development to building on a classic. Eight years in the making, Black Mesa is finally nearing its full release. Initially developed by a passionate team of hobbyist developers, this remake of the original Half-Life—fully backed by Valve—has bloomed into something more ambitious. With the help of Steam’s Early Access platform, the team has found itself with the resources to remake and overhaul the original’s controversial Xen chapters, bringing them more in line with the quality of the rest of the game. And when it’s done, this will be the best way to relive the Black Mesa incident. I spoke with project leader Adam Engels about the incredible journey so far. "The world of Half-Life is a detailed painting, where the more you look, the more you see," says Engels, speaking on behalf of the Black Mesa team. "Even though all the events were scripted, it felt like you were affecting the world. You could find hidden paths, make NPCs react to you." It was, he says, the perfect balance of letting the player create their own experiences and "a summer action movie". "I think a lot of people thought Half-Life: Source was going to be an HD remaster," he says. "In actuality, it was a demonstration of how easily projects could be moved to the new Source engine." As a response to this, two teams—Leakfree and Half-Life: Source Overhaul Project—decided to create their own remakes around 2004. "But once they realised they were working towards the same goal, they merged and started the adventure that is now simply called Black Mesa." Today, Black Mesa is available to buy on Steam, and I ask Engels if the team ran into any legal troubles with Valve. "Nope," he says. "Valve actually came to us to see if we wanted to sell the game and become an official licensee to get access to the full game engine." It was a big decision, he says, but something the team couldn’t refuse. "It gave us so much more resources to develop the game with." In November 2015 the team even visited Valve’s HQ in Bellevue, Washington. "A number of past and present developers were able to make it," says Engels. "It’s hard to speak for everyone at Valve, but the company must like us a little if it’s allowing us to do this project." Not many game companies would allow something like Black Mesa to exist, let alone be sold on its own distribution platform. But the quality, polish and passion of Black Mesa obviously won Valve over. Black Mesa is currently in Early Access as the team works to complete the Xen chapters, a massive overhaul of arguably the worst bit of the original Half-Life. "This enabled us to actually go out and hire people, and acquire talent we otherwise wouldn’t have," says Engels. "We got a huge amount of talent simply by having a project people were excited about, but having a budget let us seek out and hire specific developers." The Black Mesa team doesn’t work in one office, which can make orchestrating such a huge project difficult. "We use chat programs and online forums," says Engels. "We try and use chat to work out specific problems, then use forums to document what we talked about so we can refer to it later." Time zones are one of the biggest hurdles for such a disconnected team, and it’s basically impossible to get everyone together at once. "We try to schedule a few meetings or playtests where everyone can get involved. We’ve been using Google Docs recently and they’ve been a huge help." Engels thinks history has been crueller to Xen than it deserves. "I think the dislike of those levels might have grown in our minds as time has gone on," he says. "We see a lot of support for the old Xen on our Steam forums." The consensus in the community, he adds, is that Valve ran out of time and wasn’t able to iterate on the alien levels like they did with the rest of the game. "We can tell you from our own experience that taking your game to a new world is more challenging than it looks on paper." The Black Mesa team’s main goal for Xen is adding the same level of worldbuilding seen elsewhere in Half-Life, while retaining its alien, otherworldly feel. "Valve does a wonderful job of introducing mechanics, letting you get used to it, then using that mechanic in an unexpected way," says Engels. "We’re not looking to reinvent the game with our take on Xen, but it will be much more than just get key, open door." In the original game, what most refer to simply as ‘Xen’ is actually five chapters: Xen, Gonarch’s Lair, Interloper, Nihilanth and Endgame. They’re all being remade and expanded, and some sections Valve had to cut out are being reintroduced. "We made the design with these in mind," says Engels. "In the end we hope to have built a world that is bizarre but contiguous. We want the border world to feel like a place that exists, even if we humans don’t have the capacity to understand it." When Valve created Xen, technical and time limitations had an impact on how it looked. "With the earth-based assets, even if they were super vague due to technical limitations, we at least had an idea of how Valve wanted them to look," says Engels. "But with Xen, we had little to go on. Even if we built a 1:1 replica of the old levels (which we haven’t), we still have to ask ourselves: how was this supposed to look?" It’s unclear whether the planet was supposed to be as barren as it is, or if Valve had intended it to be much more elaborate and detailed. "The online world can seem like it wants everyone to fail, and to have a community that wants us to succeed… well, we never take it for granted." "Our biggest challenge has been designing the Xenian technology," says Engels. "It’s both mechanical and organic, which is a difficult balance to strike. Our team is talented, but it’s vastly different to modernise hallways than to create an alien world completely from scratch." 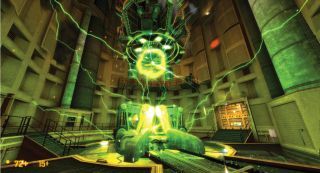 As for the Black Mesa facility itself, the team went above and beyond merely remaking the existing levels. "I think you could argue that the main character in Half-Life is Black Mesa itself," says Engels. "We wanted to modernise the game, so we had to really dive into Half-Life 2 and the episodes to look at how they were designed." The team adopted Valve’s philosophy of creating games that are "simple on the surface but complex under the hood". Some areas, particularly the dam in Surface Tension, have been hugely expanded, feeling a lot more dramatic than in the original. "We used real-world reference to get things looking as realistic as possible, then built the game on top of that," says Engels. "When you make your way through Half-Life, what made it feel real was how the facility existed beyond what you could see. A simple closet or the hint of a sprawling complex through a window was enough to create that illusion. And the Source engine really helped us capitalise on that in Black Mesa." But while Black Mesa largely remains loyal to the source material in spirit, the team did change quite a few things. "The biggest example of what we changed was the chapter On a Rail," says Engels. "We made the player path much clearer at the expense of having it feel a lot more linear." They also updated the game’s archaic crouch-jump function. "The player automatically crouches when they jump now, which makes it feel a bit more modern. Crouch-jumping was cool back in 1998, but these days it feels overly complicated." When you play Black Mesa it’s remarkable to think that it’s a passion project developed by, at least initially, a small team of volunteers. I ask Engels about the challenges of working on a project like this. "Communication has historically been a big challenge for us," he says. "Developers can feel pretty isolated. If the whole team has their heads down, working away on their tasks, despite the fact a large amount of work is being done, you have no idea unless they make a post about it or discuss it in the chat." Sharing work takes time, he says, but is ultimately worth it to keep the team motivated. "And let’s be honest," he adds. "Deadlines are a huge challenge for the team, too. Transitioning from a team of volunteers to a team working on an Early Access project, with a responsibility to the customers who spent money on it, is a really big commitment." Engels also mentions that, because people with skills specific to the Source engine are getting rare these days, it’s becoming more of a struggle to recruit people. But the team gets by. "Sometimes we’ll go out and find developers we like or post a job opening, but often they’ll contact us and their resumes will be so good we can’t say no." Audio is another area Black Mesa excels in, with professional sound, music and acting. The voices, particularly that of the scientists and ‘Barney’ are impressively close to the original game. "We had some auditions in 2006 where we found Mike Hillard for the scientists and Kevin Sisk for the security guards," says Engels. "Audio is often undervalued in projects and we were super thankful to find people who not only sounded like the originals, but really took the audio portion of the project onto their shoulders." Engels singles out composer Joel Nielsen for his music and work on the game’s audio. "He deserves a lot of credit for all the work he did on the music and sound effects." Over the years, Black Mesa has attracted a lot of attention, and a large, vocal community has grown around it. Xen has been delayed a few times as the team strives to make it the best it can be, and while some have reacted badly to this, most people have been surprisingly encouraging. "Our community continues to astound me," says Engels. "Through releases and updates we get great feedback. It’s a large-scale testing effort that we just wouldn’t be able to do otherwise and it is insanely valuable." Engels has been working on Black Mesa for close to 11 years now, and it’s been a large part of his life. "It’s easy to get isolated in development and it can be hard to stay motivated. But comments that say something like, ‘I love your work, keep going!’ are life-savers. The online world can seem like it wants everyone to fail, and to have a community that wants us to succeed… well, we never take it for granted." For someone so invested in Half-Life, I wonder what Engels feels about the third game. "Personally, I’m not eager for Half-Life 3, but nor do I want it to fade away," he says. "So much anticipation has been built up that it couldn’t come close to living up to it. I’d love to see more games in the Half-Life universe, even if the title doesn’t contain the number three. I’d love to see Valve, or another developer, take it on." Black Mesa is due to leave Early Access, complete with the overhauled Xen levels, in December this year. It’s been a long road for the team, but the quality of the finished product will hopefully make all that effort worth it.